Olive Wetzel Dennis spent years test-riding railways, improving everything from climate control to dining-car china along the way. If you had ridden the Baltimore & Ohio Railroad in the American northeast sometime in the 1920s or ’30s, you might have noticed a passenger who seemed unusually invested in her environment. While you snoozed through Cincinnati, or looked out the window at the approaching Chicago skyline, this woman was probably carefully measuring the height of the seats, or laying cloth swatches over them to check the colors. As you chose your supper in the dining car, you might have seen her sampling every single item on offer. The next morning, when you blearily left your bunk, she might have greeted you, and asked you how you slept. Although she entered the field late in life, Dennis was “a born engineer,” says historian Sharon Harwood, who often presents on Dennis’s life at the B&O Railroad Museum in Baltimore. As a child, when relatives gave her dolls to play with, she built houses and furniture for them instead. If she was late coming home from school, it was likely because she’d stopped to talk shop with local construction workers. This kind of thing did not set Dennis back. (As she herself once put it, “There is no reason that a woman can’t be an engineer simply because no other woman has ever been one.”) Soon after starting her job, she designed her first railroad bridge, in Painesville, Ohio. Within a year, she had gotten herself a meeting with Daniel Willard, the president of the railroad. In order to improve the passenger experience, of course, Dennis had to have a bunch of passenger experiences herself. And so for the next several years, she spent much of her time riding the rails. She’d take a B&O train all the way to the end of the line, get off, and immediately hop on one going back the other direction. She also traveled exhaustively on rival trains, including the Pennsylvania Railroad and New York Central. All told, over the course of her career, Dennis traveled somewhere between a quarter and half a million miles, identifying and solving problems all along the way. Dressing rooms too cramped? She expanded them, and added paper towels, liquid soap, and disposable cups. Window seats too drafty? She invented a ventilator that stabilized temperatures, and kept cinders out without blocking the scenery. “Once she took a trip to Chicago just to sleep both ways,” the Baltimore Sun reported, testing one mattress brand on the way there and one on the way back. Thanks to her, in 1931, the B&O introduced the world’s first completely air-conditioned train. “Miss Olive Dennis … probably is the world’s greatest housekeeper,” began another reductive article in the St. Louis Star and Times. In reality, though, the job was equal parts social research and design engineering. Although she was initially told to focus on female travelers, she soon found all passengers wanted improvements. When businessmen told her they had planned to prepare for important meetings, but kept falling asleep after eating in the dining car, she added salads and soups to the dinner menu. After long nights in coach—awake this time—she prescribed (and helped design) reclining seats, dimmable ceiling lights, and all-night onboard lunch counters that served sandwiches and coffee. “No details were insignificant in her view,” says Harwood. When the onboard china lost its luster, she designed a whole new set, with scenic locations depicted in the plates’ centers, and historic trains chugging along the outside. Other improvements she made include simplified timetables, easy-to-clean upholstery, onboard nurses, dining car configurations that eliminated the need for high chairs for children, and shorter seats, so all women could comfortably rest their feet on the floor. Her direct legacy, though, remains largely invisible. Dennis signed over most of her patents to the railroad. 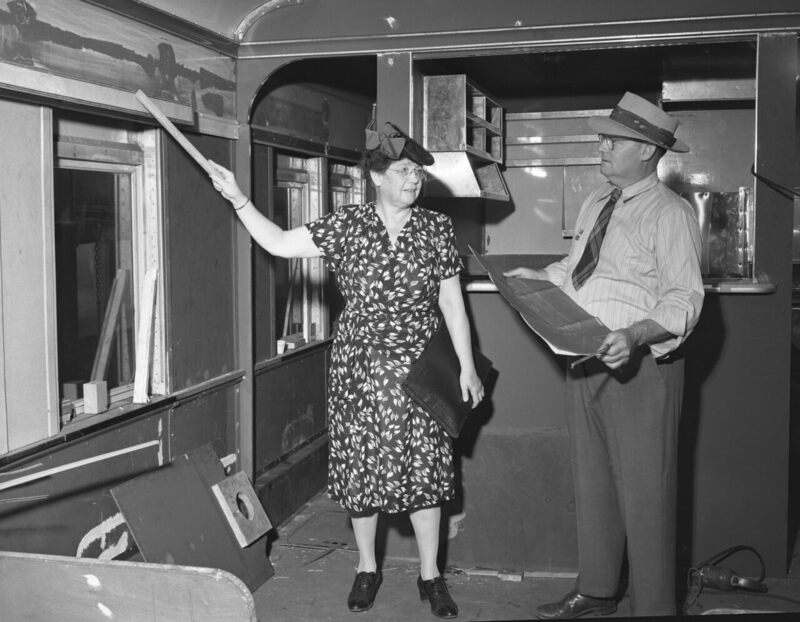 Her name does not appear in publicity materials for the Cincinnatian, the train she designed. She also went unmentioned in the advertisements the company took out touting the many new comforts she originated. And as Harwood puts it in her talk, most people outside of the railroading community don’t know who she is. So next time you climb onto a train, settle into your seat, and find yourself giving sigh of relief, spare a thought for Olive Dennis. And if you groan in pain instead, feel free to think of her anyway—she probably would have fixed it. *Correction: We originally referred to women being employed as railroad “clerics.” While train travel can be a holy experience, this was not what we meant. Hold onto your engineer caps, railroad history lovers. After an African-American cemetery was bulldozed, families wondered what happened to the graves. A looming ban on trans fats threatens the city's beloved dessert. 10 Places That Rejected Poe in Life But Celebrate Him in Death Work Out in a Bank Vault in Baltimore's Art Deco Gym Is Baltimore America's Most Eccentric City?